In connection with the Trefarclawdd Collieries an extensive brickworks was operated on the land between Trefonen Road and Pentreshannel Road, which was known as Pottery field. The row of cottages nearer to Trefonen on the right, now known as Pottery Row were the drying sheds for the pottery where tiles,pipes steins and other articles were made. The kilns were situated on the site now occupied by the cottage gardens and it is likely that the pool at Trefarclawdd is the result of digging for clay for the bricks and other products. About 1813 the products of this pottery were highly recommended by the Society for Bettering the Poor which was interested in the improvement of housing conditions of the poor. 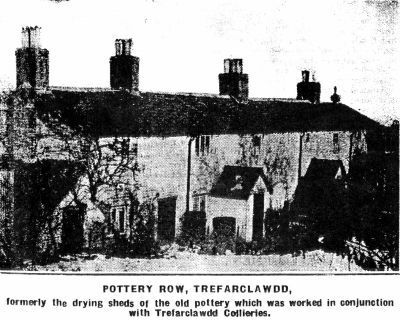 The pottery was closed down prior to 1833 for the survey of that year describes the building as "Old Pottery"
Pottery Row cottages formally the drying sheds of the old pottery which was worked in conjunction with Trefarclawdd Collieries.